Creativity is openly encouraged in all subjects at Barfield, and none more so than in the Arts. Whether it is a child presenting their very own personal interpretation of a Space portrait in Art, or a pneumatic truck in Design Technology, the children will all be encouraged to develop their imagination and creative skills. Through the Drama & Music programmes on offer the children also enjoy the opportunity to perform their pieces in front of friends and family at regular intervals. Barfield Art department aims to cater for children of all abilities and seeks to develop creativity and individual thought as well as teaching skills and techniques. The Department provides a secure and relaxed atmosphere so children feel confident enough to try out new ideas. They are encouraged to express ideas, thoughts and feelings and record observations in a creative and aesthetic manner. Pupils are helped in the development of skills and knowledge of the subject so that they all meet their artistic potential. All students from Year 3 up have a timetabled lesson once a week with the Head of Art. The curriculum ensures drawing, painting and modelling skills are taught to each year group each academic year. Within the art themes there is provision for all the visual elements to be covered. Some of these art themes also allow for cross curricular links to take place. In Year 3 the theme of “Rainbows” links with both literacy and science. The joint music and art topic of 'The Samba' allows for exciting work to take place by Year 5 children. “The Green Man” challenges the pupils in Years 7 and 8 to question issues of materialism and sustainability. All children are taught to work through the creative process and to this end are supplied with sketchbooks. These also allow them to explore ideas, techniques, hone skills and develop ways of presenting work aesthetically. 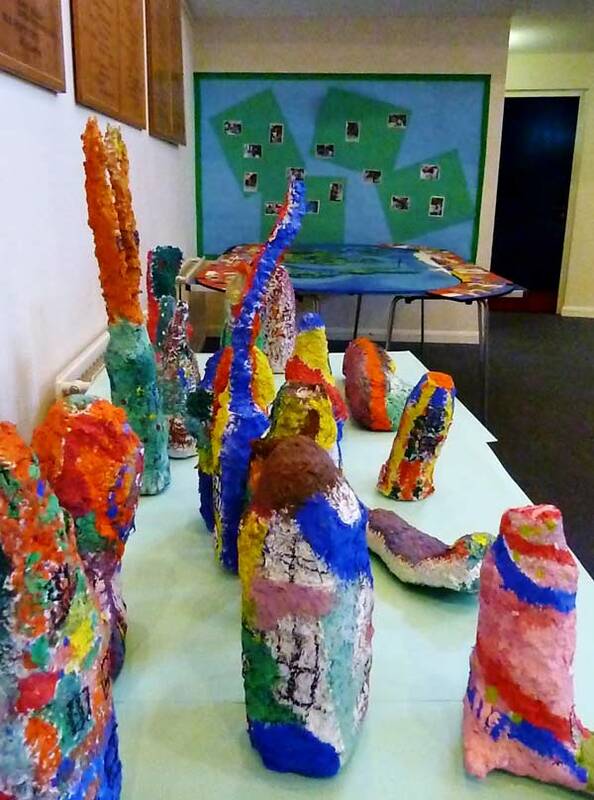 Arts week, visiting artists and trips to galleries, museums and exhibitions help to enhance the art curriculum and inspire children to explore, experiment and create outside the art room. The annual Barfield Art Show is a celebration of the students’ artistic endeavours and all children from the Nursery through to Year 8 have at least one piece exhibited at this colourful event. Those children who have a particular love for the subject are invited to attend the Boosters Group which focuses on developing skills and/ or Friday lunch time Art Club which provides opportunities for young artists to explore their own ideas. In the D.T. department we aim to introduce our students to the many different concepts associated with D.T., through the design phase, into construction and ending with evaluation of our work. We pay attention to our weaknesses as well as our strengths to discover how to improve on our initial plans. The children are encouraged to work independently using a variety of tools and equipment, from drawing boards to sewing machines. They are introduced to many techniques which they will be able to use as they move on to their senior schools. They also appreciate the input of their classmates when evaluating their projects. 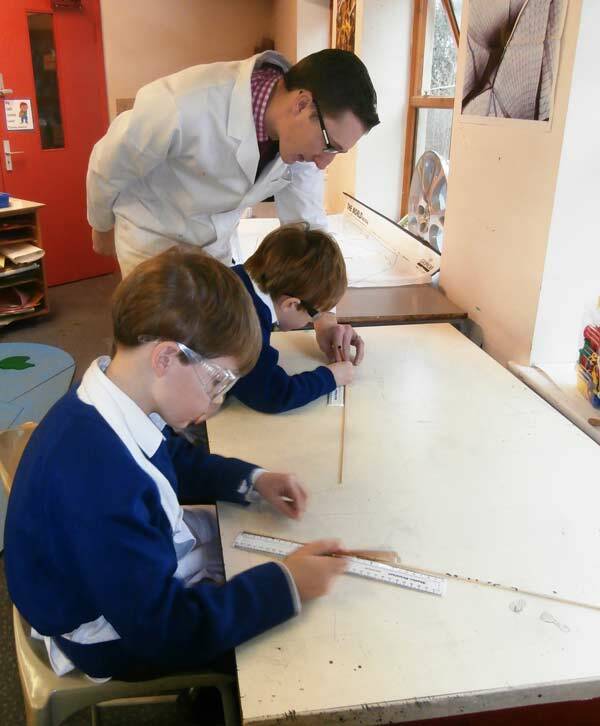 In Year 3 the children learn about two dimensional nets, accurate measuring of materials and joining methods. They are also taught to use tools safely and correctly. They learn about simple linkages and levers and how they can be used to control movement, as well as many other small projects. In Year 6, as the children progress up the school, they are made more aware of the importance of the design process. They learn graphical techniques such as isometric projection and orthographic drawing. They look at the construction of bridges, and design their own fairground ride. They are taught more advanced systems when they design a pneumatically controlled tipper truck, as well as taking a look at recycling. In Years 7 and 8 the pupils look at more complex problems, such as designing working kites, and producing a controlled vehicle. In systems we look at electrical components and their uses, and then put them into practice by designing and making a steady hand game. In Year 8 pupils work in teams to design and make a load-bearing bridge using a limited amount of supplies. The bridges are then tested to destruction to see which one can hold the most weight. The projects detailed above are all taught with the children’s safety in mind and, as such, before any work with tools is undertaken, a full briefing and demonstration is carried out. To help enhance our English we embrace Drama at Barfield. We have weekly Junior and Senior Drama Clubs. The Juniors celebrate Poetry in a 'Rhythm and Rhyme' show and our Senior children perform in the Summer Production. The children can experience LAMDA Speech and Drama and Musical Theatre and the children have an opportunity to do an English Speaking Board Examination. Barfield School is well-known for excellence in music. We have choirs - Pre Prep, Training and Senior. When appropriate a Chamber Choir is formed for certain events. All perform regularly at school events such as concerts, Harvest Festival, Speech Day and the Carol Service. We also take the choirs to perform at the Farnham Lights switch on and local residential care homes. The Orchestra, comprised of children receiving instrumental tuition, perform a selection of pieces each year. We also have a ukelele groups. Tuition is currently available on orchestral instruments plus pianoforte, drum kit, bass, electric and acoustic guitar (both classical and rock). Pupils are entered for Associated Board of the Royal Schools of Music, Trinity/Guildhall and Rock School examinations. There are plenty of opportunities for performance in concerts, assemblies and other special occasions. All the children from the youngest Owlets (2-3 year-olds) to those in Year 8 are given high-quality specialist class music tuition. A whole-school music policy ensures continuity of learning from Foundation stage through to Key Stage 3. The pupils are taught broadly according to Kodaly and Dalcroze principles. Music scholarships may be awarded to pupils showing suitable potential at audition for entry into Year 7 at Barfield. Please contact the Director of Music, Ms Melissa Lynch, for details. A number of Barfield pupils have won music scholarships to senior schools of their choice in the past and pupils are regularly assessed for musical potential and progress to ensure that any talent they show is properly nurtured.